Personalized picture frame for a new baby gift. Unique in it's style and quality this stained glass picture frame has a clear glass panel to the left of the photo that can be enraved with 5 lines. Clear glass with an embossed vintage texture accented with metal filigree corners surround a 4" x 6" horizontal landscape photo. 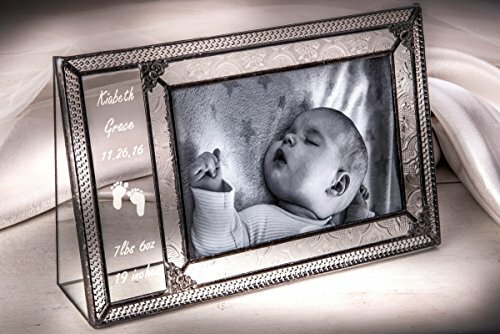 New baby picture frame for parents or grandparents. Designed and Manufactured by J Devlin Glass Art 9 1/2" x 5 3/4" x 2"